Like many of my clients, I run a small, solo business, based in a home office in Perth, and I wear pretty much all the hats in it. But it’s sometimes, of course, difficult to be on top of everything at once. Looking back over 2017, I’m happy to say that I have had a successful business year, my best one yet since starting up this business kind of by accident back in 2010, and yet that I can still see lots of things I can do better in 2018. Since I embraced the fact that I need to do a few different things at once – which means running my social media and blogging consultancy in parallel with my travel blog and podcast (and they even intersect quite often, in fact!) – the variety of sources my income derives from has increased even more. A few things went particularly well in 2017. I was really pleased to be able to start up a second mastermind group. Obviously, the mastermind groups I run (which are a mix of social media/blogging training, accountability, and more) are “good for business” because they are recurring revenue, but mostly I’m pleased because I love doing them. It’s much more satisfying to work with clients over the longer term – and give them some tough love to implement what I teach them! – than just to see them get excited about an idea in a workshop, then either go home and not follow through, or I just don’t get the chance to see the results. I’ve also been steadily increasing the number of public talks I do, which is great as I really have so much fun doing public speaking and I’ve had the chance this year to speak about Facebook, social media in general, blogging, cybersafety, the wonders of travel and more. I had some wonderful consulting clients in 2017, both in terms of “one-off” client sessions with people who wanted to learn a particular skill or get some strategic advice, and also some longer-term projects with small companies and individuals in various sectors. I love the variety of this work and will continue to do more consulting next year. You’ll see the chunk of income on workshops is relatively small – I have still been running quite a few workshops, but this year they just haven’t been as profitable, as I’ve had to spend more time and energy getting sign ups. I still adore running workshops, and go home feeling so buzzy about them, but the on-paper fact is that for the administrative and marketing time they take, combined perhaps with the fact that people in general are spending less on workshops at the moment, means that they’re the thing I’m potentially going to do fewer of in 2018. I also want to increase earnings on the travel side of things. 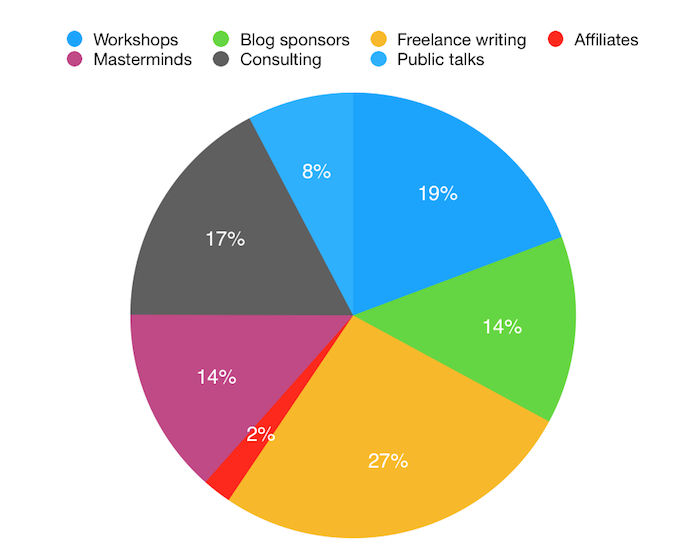 This includes affiliate and other blog advertising income, as well as increasing sponsor work by taking on some great sponsors for The Thoughtful Travel Podcast. Over the last six months the listenership has grown enough for this to be possible which is wonderful, since creating the podcast is something I really enjoy just so much. Thanks to everyone who booked a Summer Special – my time filled up really quickly and it was fun to see so many new clients coming along! After keeping to the same hourly rate for the past three years, I’m raising my consulting rates slightly from 1 February 2018, but ahead of that I’ve got a summer special going on! Have you spent some time looking at how 2017 went for you? And made plans for 2018? I’d love to hear how that’s going – leave a comment below.